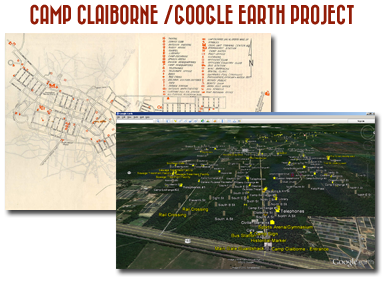 , was located just north of the town of Forest Hill, Louisiana on state highway 165. 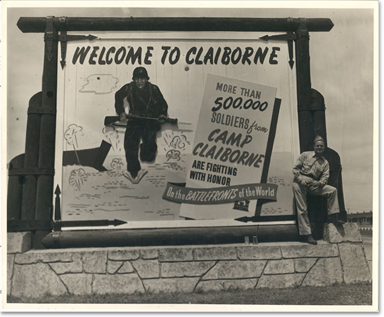 Built in 1940, Camp Claiborne was home to the largest wargames in American history, the Louisiana Maneuvers in 1941 and was the birthplace of the much storied and celebrated 82nd and 101st airborne divisions. 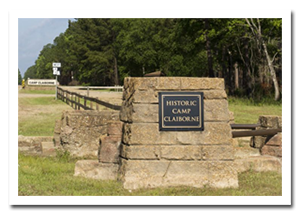 During it's brief existince, lasting just over 5 years, Camp Claiborne saw over a half million men pass through it's gates. It was a small town unto itself, complete with it's own railroad linking them to nearby Fort Polk. Once victory had been won for the Allies, the camp, having served it's purpose was deactivated. By 1946, the last of the personel had left, buldings were sold for scrap or moved intact elsewhere. The forestry service took posession of the land and was reforested. Nature has reclaimed most of Camp Claiborne and all that remain are concrete pilings, foundations, a few small concrete buildings and some of the camp roads. This site remembers the Camp, it's people and it's stories.